I get why Canadians visit the Caribbean. It’s relatively accessible, affordable and safe, with the pull of the sun, the sand and the sea. But in these days of global travel with so much competition for our vacation dollars, why is it that we return to this region time and time again? I have a theory. The Caribbean persona mirrors the way our generation perceives itself. In our lifetime, we’ve managed to preserve our good parts—the laid-back, free-spirit ideologies of our youth, say—but, rather than resting on such laurels, we’ve risen to challenges, adapted and continued to change. Since the Caribbean Travel Association was formed in 1951 to represent the islands as a single destination, the movers and shakers of the region have done the same. Take visionaries such as Chris Blackwell, the founder of Island Records. He could have retired to a hammock after bringing Bob Marley and the Wailers to the world but instead, he has spent nearly three decades bringing the world to Jamaica. Today, at 79, the owner of Island Outpost, a company that features such luxe resorts as Golden Eye and Strawberry Hill, wheels and deals with the rich and famous but reportedly doesn’t own a suit. He also works with Jamaica’s tourism body to help promote the island globally. Then there’s Sir Royston Hop-kin. After a distinguished career that spanned 40 years, in 2005, the Grenada-born hospitality and tourism veteran became the only hotelier to be knighted by the Queen. Whereas many would have hung their hat on the title, Hopkins continues to work diligently with the Caribbean Alliance for Sustainable Tourism to save the planet, yes, but also as a shrewd response to our increasingly ecologically conscientious times. His family-run AAA Five Diamond resort, Spice Island Beach Resort, is renowned for its luxe appointments, golden beach and grounds graced with lemon and almond trees. Of course, you can’t talk about the life coaches of the Caribbean without mentioning Jamaican Gordon (Butch) Stewart, the founder and chairman of the couples-only, all-inclusive empire, Sandals, as well as Beaches Family Resorts. At 75, he continues to elevate the “all-in” category by creating properties with the aim of competing with the finest pay-as-you-play resorts. Mind you, if you bumped into him on the grounds of one of his properties, you might mistake him as a guest. The brilliant businessman is without airs. When I met Stewart at Le Jardin-ière, one of 10 restaurants at Sandals LaSource Resort in Grenada, he was clad in a golf shirt and ball cap and affably patted the empty spot next to him so we could chat. With the passion and pride of a patriarch introducing his just-born prodigy to the world, he took me through the resort’s conception-to-delivery story. Grenadians are a friendly people. During a visit to the nearby capital of St. George, the folks at the Market Square cheerfully bartered and bantered as I sorted through their wares. While I was surveying the ruins of a former government building, a policeman stopped to recount the hardship suffered in the wake of 2004’s Hurricane Ivan, which left 90 per cent of the homes and structures damaged. At historic Fort George, two women working the ticket booth showed me how to make spice necklaces and then generously gave me a few. Mind you, sometimes I was too out of breath to uphold my end of these conversations. Built along the hillside of a long-dormant volcano that slopes into the harbour, the 350-year-old city comprises a maze of streets, some so steep mere wandering is a workout. That, coupled with the views from the top of the town, can leave you speechless. 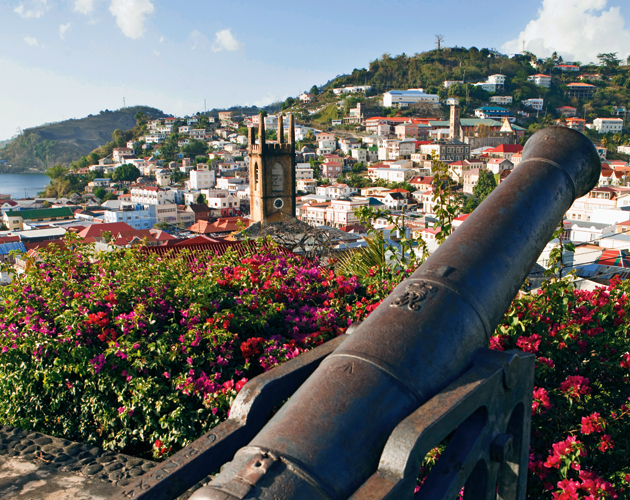 Sadly, the history of Grenada is a bloody one. Before Columbus laid eyes on it in 1498, Caribs had settled the island after overtaking the Arawak, the other indigenous people of the region. Britain and France battled for control over the ensuing centuries with the French in possession by 1674 and onwards until Grenada was ceded to the Brits in 1783. It wasn’t until 1974 that Grenada achieved independence. But a few years later, the People’s Revolutionary Government overthrew the government. After the Revolutionary Military Council took over, the U.S. invaded in 1983. In late 1984, democracy was restored. In 2012, Stewart’s long-time dream of putting a Sandals property on the island came true. It was then his company purchased a resort that had closed its doors and began a massive renovation and expansion project. The result is a seaside sanctuary with 225 rooms (or “keys,” as Stewart calls them) spread across three villages – Pink Gin, Italian and South Seas. Water flows everywhere. While some suites offer direct beach access, others feature a private infinity pool, whirlpool, plunge pool, soak tub or a combination. Three public swimming pools grace the lushly landscaped property, one with a fireplace and cosy seating area in the middle. Other highlights include a spa, an open-air bar and dance floor that serves as the main communal social space, and Butch’s Chophouse, the brand’s first-ever steakhouse. Astonishingly, the makeover took only 11 months to execute. “This is Grenada,” Stewart explained. “A no-crime country of 100,000 people who want to see things work. “The “high-end” segment of the industry goes back to the 1950s when there was no mass-market tourism, but boutique hotels serving the rich and famous were cropping up in Puerto Rico, the U.S. Virgin Islands and Jamaica. The “all-inclusive” concept emerged in the late 1970s with John Issa and Couples Resorts followed by Stewart and Sandals. Was this Stewart’s favourite property? “LaSource is definitely the Sandals of the future. It raises the bar. People want value for their money and no matter where you go, you won’t get any better than this,” he says. Although I couldn’t resist hanging out into the night and listening to music beneath the stars, secretly, I wanted to get back to my decadent room and revel in my decadent day. But that’s the thing about the Caribbean. Just when you think it doesn’t get any better, it does. Kind of reminds me of how I like to think of my own life. A version of this article appeared in the March 2017 issue with the headline, “Life Stages In Grenada,” p. 81.